Once a mighty fortress of the counts of Chinchón, the town’s 15th-century castle now houses an anisette distillery—a fate the counts undoubtedly never imagined. Another town claim to fame dates back to the 17th century, when the countess of Chinchón was married to the viceroy of Peru. She came down with malaria while living in Peru and was cured by an Indian there who used tree bark as medicine. She brought back quinine from South America, and the tree it was derived from was later named chinchona in her honor. The first lords of Chinchón (a title granted by Queen Isabel in 1480) established an Augustinian convent off the main square. The present brick and masonry building dates back to the 17th century, when the friars taught Latin studies here. When the state secularized church property, the 30th count of Chinchón, Luis María de Borbón, gave the convent to the town. It served as the town courthouse and jail until it was returned to the government for use as a parador. The traveler to Spain can all too easily overlook its small, quaint villages in favor of the more famous destinations of Madrid and Toledo. The medieval village of Chinchón is well worth a visit. Its surrounding hills are cool, and its atmosphere is peaceful—unless it’s a weekend during the summer bullfight season, when people pour into town. The Plaza Mayor in the town’s center, which is surrounded by three-story-tall covered galleries and arcades, has hosted these bullfights since 1502. Chinchón can serve as a convenient base for exploring the countryside surrounding Madrid. Located 20 km away, through hills covered with olive trees and grapevines, Aranjuez is the spring and fall home of the Bourbon kings and their famous royal gardens and palaces. Chinchón is 46 km southeast of Madrid. Take National Road III (the main Madrid- Valencia highway) and exit at the Arganda bridge. Go south on regional road C-300 to Chinchón. A car is the best way to get around, although buses service the town. Ten years of restoration resulted in this charming hotel. 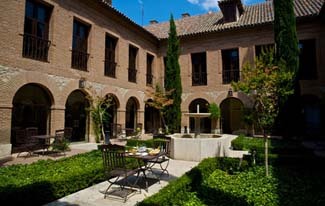 Glassed-in cloisters look out onto courtyards filled with fountains, fig and pomegranate trees, and rose gardens. Modern tapestries by Spanish artist Rosa Cubero hang on the walls. A lovely gold-and-pink, high-domed ceiling above the staircase marks the way to the guest rooms, found along low, round-arched whitewashed corridors. The furnishings are few but well chosen: handwoven tapestries depicting archangels, white rugs on pale floor tiles, a ceramic art piece here and there, and lacy bedspreads. Some windows look out over the courtyard and gardens. You can sample the local anisette in a lounge decorated with beautiful blue Moorish tiles. The El Convento restaurant presents traditional fair, and El Bodegón on the weekends and holidays offers seasonal specialties: cocido—a traditional stew—during the winter months and la Cocina de la Vega a lighter summer fare, both of which bring in the crowds from Madrid. Occasionally during the spring and summer months, bullfights are held in the town’s Plaza Mayor.